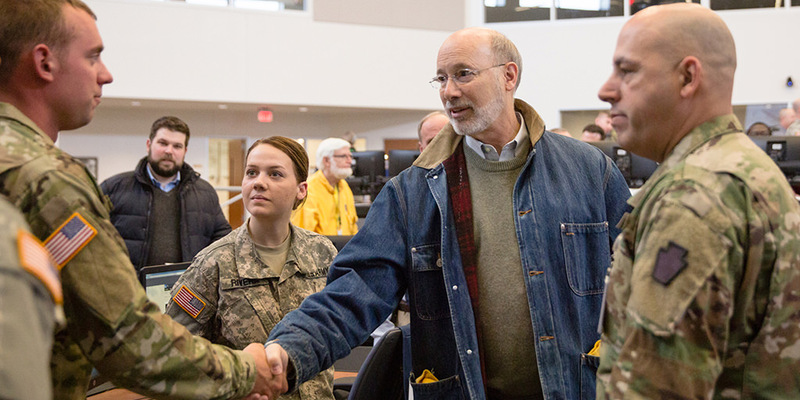 Harrisburg, PA – Governor Tom Wolf this evening announced that 21 Pennsylvania National Guard (PNG) troops have been put on State Active Duty in northwestern Pennsylvania after a record amount of snow fell across the area over the last several days. The PNG is providing a number of high clearance all terrain military vehicles to aid local agencies with medical emergency and law enforcement response, assisting with safety and wellness checks, transporting essential emergency services personnel, and assigning a liaison to the Erie County Emergency Operations Center. Pennsylvania has the third largest National Guard in the country with approximately 20,000 members located in more than 80 armories and readiness centers statewide.